Duluth SAGE Direction Center DC-10 (1959-1983) - A Cold War SAGE System Direction Center first established in 1959 on Duluth Airport, Duluth, Saint Louis County, Minnesota. Named Duluth SAGE Direction Center after the location. Assigned a Sage ID of DC-10. Deactivated as a SAGE Direction Center in 1983. Construction began on 2 May 1956, the building was accepted on 20 Nov 1957 and the direction center became operational on 15 Nov 1959 as Duluth SAGE Direction Center DC-10. The Duluth SAGE Direction Center was one of the six direction centers designated as a SAGE Regional Control Centers (RCC) in 1966 and it remained operational, still using the vacuum tube FSQ-7 computers, until deactivated on 1 Apr 1983. Sage Direction Center blockhouse repurposed as the Natural Resources Research Institute, University of Minnesota - Duluth, Duluth IAP in Duluth, Saint Louis County, Minnesota. Location: Duluth IAP, Duluth, Saint Louis County, Minnesota. 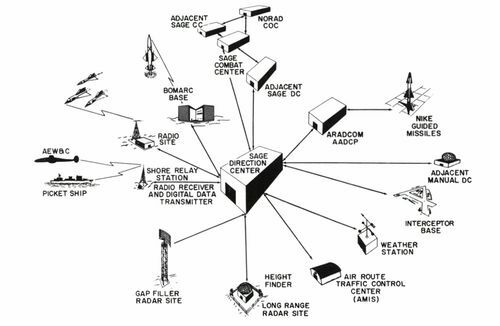 Winkler, David F., Searching the Skies: the Legacy of the United States Cold War Defense Radar Program, USAF Hq Air Combat Command, 1997, 192 pages, Pdf, page 47, 127. Ulmann, Bernd, AN/FSQ-7:the computer that shaped the Cold War, 2014, Walter de Gruyter GmbH & Co KG, ISBN 978-3-486-72766-1, 272 pages.